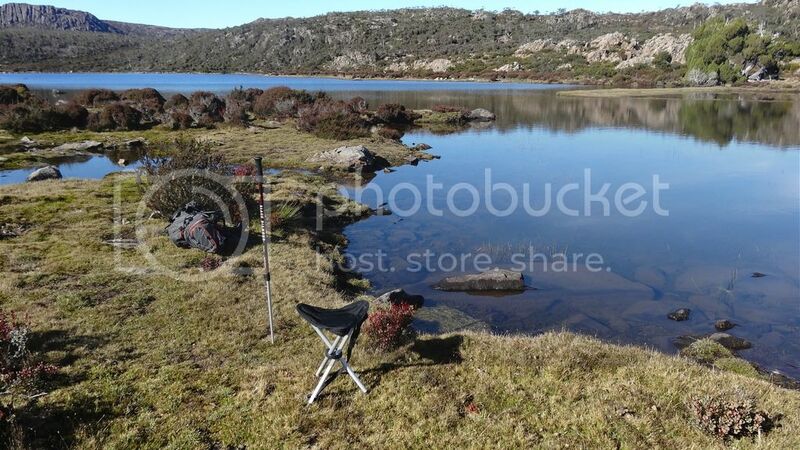 We are off fishing again across the central plateau in 2 weeks, this time around the Bar Lakes system. We are planning to head up Dixons Track, which runs off the Meander Falls track. Normally we don't need to take water on our hikes, as we are always moving along the available lakes. Track notes suggest Dixons is 1-2 hours to get off the escarpment. Does the track run along a creek where we could grab a drink, or will we need to take a small amount of water for the climb up? Second question is does anyone know some camping spots at deep lake, grub lake, lake furmage, 1st and 2nd bar lakes etc? re camping: Pick a bit of ground you like, pitch your tent. There are approximately 57,691 usable sites around those lakes. I went up Dixons Track last summer, and there wasn't much water in the creek. Reckon it's much drier now, so I wouldn't count on it. Not far to carry some, though. I'd keep an eye on the fire situation, though, with more dry lightning strikes likely in the near future. north-north-west wrote: re camping: Pick a bit of ground you like, pitch your tent. There are approximately 57,691 usable sites around those lakes. I've spent a fair bit of time in other parts of the plateau...grassy spots free of rocks and reasonably level aren't easy to find! You have obviously spent a fair bit of time in the wrong parts of the CP. This is Grub Lake. If the patch of ground I'm on (which is considerably more extensive than this shot shows) isn't sufficiently level and free of rocks, you must be one hell of a lot fussier than I am. Furmage has similar ground, as do the Bar Lakes. Can't remember Deep well enough to guarantee it, but I do recall being spoilt for choice during that part of the trip. I don't have any problems finding a spot up that way to pitch my tent, I'd be wary of the fires up that way this week ain't look good. Can you say which lake you have pictured? Keeping a close eye on the fire situation. 2 years ago we were kicked out of the park because of fires that were much further away than the present ones around great lake.